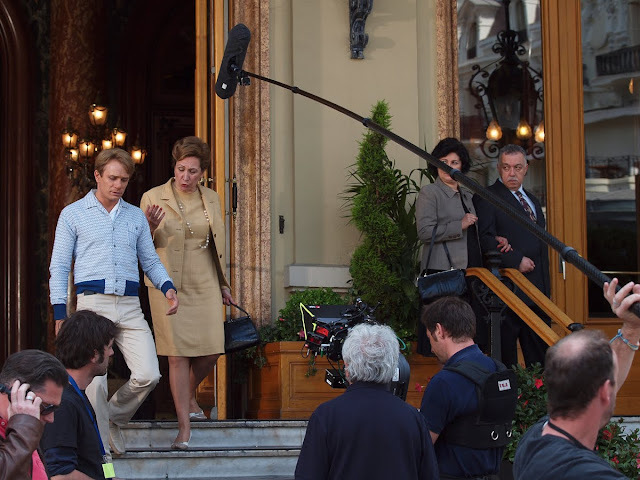 Monte Carlo's famous casino and square was taken over yesterday morning by a film crew who are making 'Cloclo' based on the life of Claude François. Claude François was an incredibly popular singer in the 1960s and '70s in France. His formula for success was adapting British and American rock and roll hits for the French market. If you've never heard of him, then think of the Frank Sinatra classic 'My Way' which he co-wrote with Jacques Revaux. The song was known in France as Comme d'habitude (As Usual). Paul Anka supplied the words to My Way. In March 1978 he's returned from a gig in Switzerland to in his Paris apartment in order to appear, the next day, on 'Les Rendez-vous du Dimanche' with TV host Michel Drucker. While standing in a filled bath, he noticed a light bulb that wasn't straight, tried to straighten it with his wet hands and was accidentally electrocuted. His tragic death at only 39 years of age brought a wave of public sympathy for a French national treasure. The part of Claude François is played by Jérémie Rénier (seen coming out of the casino in this photo) who bears a remarkable resembles to the late singer. However, despite is pretty boy look, Francois was a tortured soul and not always the nicest of people. Well, we'll all have to see the film, won't we? Good news about the Claude Francois film too! How great to be see a film being made. Mind you, I think the whole of Monte Carlo is a film set.